Do you want a pair of damn tough boots that can withstand the harshest conditions while you’re felling trees? Do you constantly have to climb up and down the stairs or trees and need good traction and support? Then you need the best logger boots for the job. 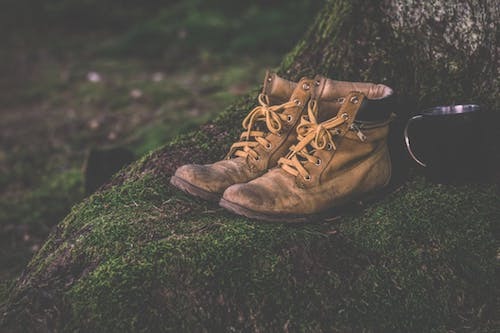 These boots are specially designed for the risks and challenges involved in logging: falling branches, slippery wet leaves or climbing on the wet bark. So along with your other safety equipment, logger boots will keep you protected while on the job. First, I’ll talk about the most important things to consider before buying the best logging boots. But before that, if you’re in a hurry, the table below contains all the logger boots we’ll analyze in this article. Further down you can read each individual review. Felling trees isn’t for anyone, and you need the right help to keep you safe while doing that. One of the most important factors when deciding if a pair of boots is good enough for you is how supportive and stable they are. That’s why I like rigid shanks, considering they keep your ankle steadier. If you’re constantly climbing trees or stairs, you need some reliable footing in the form of a slip-free outsole, made from rubber or Vibram. 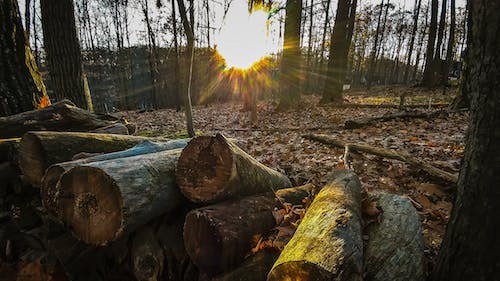 There are many dangers lurking in the shadows if you’re working in the logging industry, like falling branches, machinery gone wild, as well as a very common risk of you stumping your feet. Plus, you’re almost never sitting down. That means you want protective boots, made from good materials that can withstand a high degree of wear and tear. For that reason, most logger boots feature leather uppers that won’t scratch or puncture easily. You also want to look for rubber soles that can face sharp objects too. If you work in a dangerous environment, you might want to consider reinforced toe boots, with steel or alloy toes to protect you against impacts or compression. 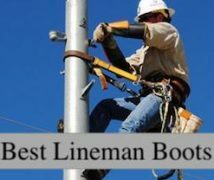 There’s always the option of getting composite toe boots if you need maximum protection against electrical hazards and not-so-great protection against impacts. Otherwise, soft toe boots offer the least protection against falling objects and the such, but they’re the lightest of the batch. Traction is really important if you’re working on slippery grounds, in inclement weather, if you’re constantly climbing up and down or in an environment with a lot of chemical waste. So the best materials for the job are rubber and Vibram, but you should also look for a lug design. That’s what gets you an increased protection thanks to extra scales that create more friction. Besides, make sure the traction boasted in the official specifications stands even in cold weather. That’s because some very smooth rubber or Vibram soles will protect you from slipping when there’s oil on the cement floor above freezing, but will backfire on ice. A higher heel can be great if you’re climbing trees or navigating difficult terrain, offering increased grip. However, it might not be extremely comfortable if you suffer from plantar fasciitis or if you’re simply not used to this sort of design. Just make sure you take a few extra days to break your boots in if you opt for a pair with higher heels. You should also take into account that a 2 or 3-inch heel you’re not used to can destabilize your ankles, so make sure you tie those laces really tight. If you’re always working in an environment with lots of rains, puddles, and snow, you need waterproof boots for the job. Some types of leather, like full-grain leather, are better at this, but remember that most work boots need constant care to keep their waterproof feature intact. You can also opt for a pair of boots that’s only water-resistant if you’re working in generally mild weather, with a few short spots of rain. However, make sure the lining and membranes are waterproof or water-resistant too, and that water can’t get inside your boots through the eyelets. Comfort is essential for a reliable pair of logger boots, so you won’t get blisters, arch pain or back pain. That’s why you should look for ergonomic designs that can support your arches and your ankles. A reliable padding and footbed are nice additions for extra cushioning and absorbing shocks, but you should make sure your boots are weather-appropriate. If you get a generously padded pair of boots with extra insulation, your feet will feel nice and warm at very low temperatures. But the same pair of boots can make your work day a living hell if you’re working in warm weather, so make sure you don’t get carried away by the promise of warm, cushiony padding. These good-looking loggers definitely win a top place in our reviews for their aesthetics. With their nice brown or tumbled chocolate colors, they sport some exciting qualities that render them strong and resistant. Take their full-grain leather uppers for instance; these are resistant to abrasions, just like the rubber outsoles. In fact, the risk of falling is very slight thanks to their non-slip rubber outsoles. I like how sturdy and versatile these loggers are, thanks to 8-inch shafts that will really prevent your ankles from wobbling. Double that with steel shanks, and you can understand how supportive these boots are. However, all these materials add up to the weight as well, rendering a 6.1 pounds pair of boots that might be considered slightly heavy. On the other hand, I like the strength and durability of the materials used. While the Goodyear welt might add to the overall weight, this is a super resistant stitching that can also be repaired very easily. The steel toe adds to the pounds as well, but it’s also rated ASTM F2413-05 I/75 C/75 Electrical Hazard G7313, so you can definitely use these loggers in different work environments. And if you’re wondering how comfortable these loggers are, I give them 4/5 stars for that. You can easily break them in and they’re quite comfortable thanks to their removable polyurethane orthotic inserts. I would order one size bigger if you’ve got wide feet. Still, you get a great 1-year warranty for these loggers in case there are any manufacturing errors. The Gore-Tex liners are also covered by this warranty in case they leak, and remember that the boots are completely waterproof for about 6 months. After that, you’ll have to waterproof them again yourself. These Chippewa Men’s are some of the greatest and you can see that reflected in the somewhat steep price. But they do boast some enviable qualities that will prevent you from regretting having bought them. Firstly, they’re made in the USA, so that’s a solid reassurance of their quality. Secondly, they have leather uppers which are really resistant to all sorts of scratches, punctures, and abrasions. Their synthetic soles are really sturdy, offering great traction on all sorts of terrain. In fact, the Vibram Tacoma material used for the outsoles is a compound specifically designed for wet surfaces, boasting amazing slip resistance against oil and water even in cold weather. I also like their high shafts, each 9 inches from the arch, so your ankles are supported. And these boots are waterproof too, with a Chip-A-Tex membrane that’s also breathable, not just waterproof, so your feet will feel really comfortable inside. Add to that the Dri-Lex liners, and you get a moisture-wicking pair of boots that will keep the sweat away. And you might really need that, considering their 400 gram Thinsulate insulation. This is really great for cold weather, it’s one of my favorite boot insulations because it’s light, but it’s lacking on breathability. These boots are great for cold weather but can be a bit much for really hot days. You also get orthotic insoles with the Chippewa boots too, the Texon 460 waterproof ones that can easily be removed. These loggers are equipped with Goodyear welts, which are really resistant for rugged terrain, and don’t forget the valuable steel toes that meet the ASTM F2413-05 standards for impact and compression. These boots need quite some extensive breaking in, about a week or two to get the job done. Migrating to shallower waters in the price pool, these Carolina Logger Boots boast some high heels of their own, just like their more expensive counterparts, the Chippewa Men’s. These might feel a bit weird at first, but they’re definitely an asset on wet terrain so you know these loggers are really well performing in rainy weather. You can rest assured that their stitched soles will last you for long and their waterproof membranes are indeed 100% waterproof. These Carolina logger boots are among the most comfortable on the market, they can really compete with more expensive products in that regard. Besides, they have a short breaking in time, without fatiguing your feet. 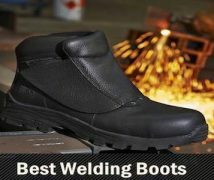 However, these boots only boast a soft toe, so they won’t give you any protection against impacts, cuts or compressions. They’re EH-rated though, so you can confidingly wear them in places with electrical hazards. Still, remember that these loggers aren’t insulated at all, so it’s best not to wear them when it’s extremely cold outside. And since they have leather uppers, you can’t really wear them when it’s extremely hot either. But with their 8-inch shafts, the Carolina boots will keep your ankles steady on iffy terrain, and you can count on the leather uppers to last against scratches. The lug soles are a nice design feature, considering they offer such a terrific grip. And don’t forget about the steel shanks, these are another valuable quality in terms of support, although they might add to the overall weight. These Adtec boots bring us to even shallower waters in the price pool considering they’re almost half the price of the Carolina loggers. And even if they’re cheap, they still offer some good, reliable qualities. For instance, they look pretty stylish, with a brown or black body and striped heels. Their leather uppers are suede, which is a lighter material than full-grain leather, so these boots weigh less than 4 pounds total. That’s great for a pair of boots, which means you can easily use them for climbing trees or stairs. Plus, their rubber soles offer decent traction for that. However, the uppers are oiled, so don’t be surprised if you find some oil residues inside the boots. That’s meant to make them more water-resistant, so that these loggers can hold their own to a rain or two, but they’re not entirely waterproof. You might like the minimal padding and the unlined, non-insulated design, particularly if you’re working in warmer temperatures and you need a light work boot that won’t heat up your feet. And even with no inserts, these boots are pretty comfortable, but you need good socks for that. I also like their 9-inch shafts, winning the Adtec loggers valuable points on overall comfort and support. However, these boots don’t offer any sort of protection against impacts, compressions or electrical hazards because they don’t have a reinforced toe. Carharrt is renowned for manufacturing comfy footwear, and these are definitely among the most comfortable logger boots in our reviews and on the market. That makes them perfect for all sorts of terrain, especially when you’re working long shifts. Just keep in mind that the fit is a bit small, so order a half size bigger to make sure your feet feel nice and cozy. But apart from that, I like the molded TPU heel stabilizer that has an anatomical, ergonomic design, so your back-feet are protected and steady, even with the rather high 2-inch heels. But these heels are great in rainy weather and difficult terrain. So while the 100% waterproof membrane keeps you dry from rain, the WoodWorks logger outsole will help you navigate rugger grounds, resisting oil, chemicals, and slippery slopes. Another point in the favor of their comfortable construction comes courtesy of their polyurethane Strobel pads, that do wonders for absorbing shocks. The cushion insoles contribute to that too, and they also keep your feet well-guarded inside the boots. However, the lacing system isn’t something I love, the laces might become undone from the top eyelets if you don’t tie them down with secure knots. And you definitely need secure lacings for work boots, especially if you want to keep your ankles steady. However, the 7-inch shafts of the Carhartt boots definitely prevent your ankles from wobbling. I also appreciate the Goodyear welt design that’s really resistant and easy to fix in case the stitching fails. And the composite toe is great for guarding you against minor impacts, though its main feat is compliance to the ASTM F2413-11 EH standards, keeping your feet safe from electrical hazards. The fringes on the Wolverine Buckeye logger work boots remind us of the Georgia loggers we reviewed at the start of this article, like many other features they sport, starting with pretty much the same price range. These boots are 100% full-grain leather as well, meaning they can withstand punctures and abrasions, though they feel a bit softer than expected. But the shafts are higher, 9.5 inches each so you can rest assured your ankles will be well-supported. I like the Vibram lug soles of these boots, considering that Vibram is a tough, anti-slip and puncture-resistant material. But the lug construction also offers good traction, so you can wear these boots confidingly on steep, slippery slopes. Besides, these are waterproof logger boots, so they’re a match made in heaven for cold, rainy weather. If you choose the W05632 model, its 400 grams 3M Thinsulate insulation is perfect for this sort of inclement weather, keeping your feet warm and cozy. On the other hand, Thinsulate is a bit much for hot temperatures, though it can perform well in mild weather if combined with a Gore-Tex membrane as in this case. That’s because Gore-Tex isn’t just waterproof, but breathable too, so it wicks moisture and lets your feet breathe. And again, I like the Goodyear welt construction because it’s such a durable, reliable sort of stitching, offering increased support in poor weather and terrain. Besides, the aluminum reinforced toe is great in terms of protection against impacts and compression. However, the 2.25-inch heels might be a bit much if you’re not used to this design, but they’re great for navigating bad ground as well as for climbing. The Timberland PRO Men’s Crosscut boots offer a design meant to ease any discomfort the plantar fasciitis might cause you. That’s thanks to their ergonomic design and amazing arch support, which will have you working prolonged shifts with no pain in your feet or in your back. And these boots don’t just feel comfortable on cement, you can take them out on rugged terrain, on snow, and in puddles and still feel great. One of the reasons is their Vibram lug rubber soles, that provide increased traction and grip on slippery grounds, but the Goodyear welt offers increased resistance and durability too. Besides, the 9-inch shafts are well-supportive. You can choose between two models: a brown one made from suede, or a black full-grain leather model. Both of these are resistant to abrasions and punctures, as well as waterproof. However, the brown model needs to be waterproofed more frequently, although it’s lighter. On the other hand, make sure you choose half a size bigger because these boots might run somewhat narrow. The downside to all these high-quality materials is that they add to the overall weight of these boots, which might feel a bit heavy for a soft-toe model. That means you won’t get the maximum protection against impacts and compression that steel or alloy reinforced toes offer, and there’s also no electrical hazard protection. However, I like the speed lacing system, it really helps you put your boots on in no time, and the laces are really secure. But as much as I appreciate safe, fast lacing systems, the easy on/off “fingertip” feature is definitely something you don’t see every day and a really user-friendly feature. In our logging boots reviews, we’ve taken you through an extensive series of logger boots, all of which are considered the best on today’s market. We’ve discussed water-resistant models, with different sorts of reinforced toes and various designs, manufactured from grade-A materials. And best of all, we’ve swum through the entire price pool, so you can definitely find something that fits your budget. So now that you’re here, tell us what you think of these. Which one would you buy and why? We’re eager to hear more from you, so leave us your comment below!